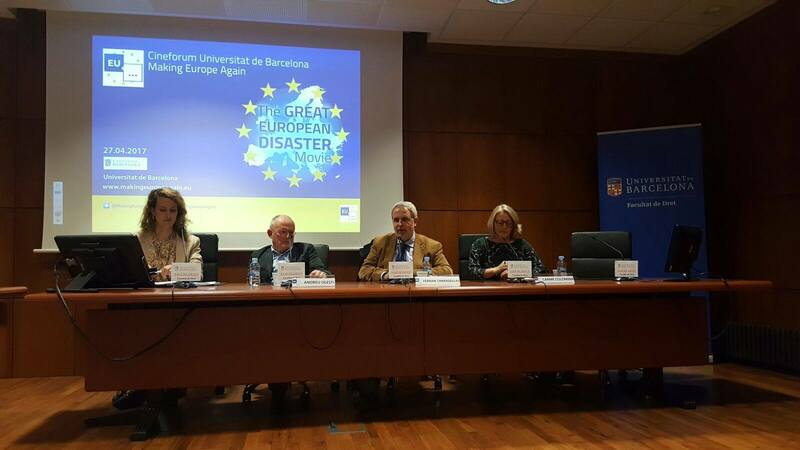 On Thursday, April 27, Making Europe Again in collaboration with the University of Barcelona hosted the screening of the film “The Great European Distaster Movie” followed by a debate, that among other topics, focused on the new challenges for the European Union and its future. For this, we have to thank our own Ana Sánchez Cobaleda, director at MEA, whose planning and management made this all possible. 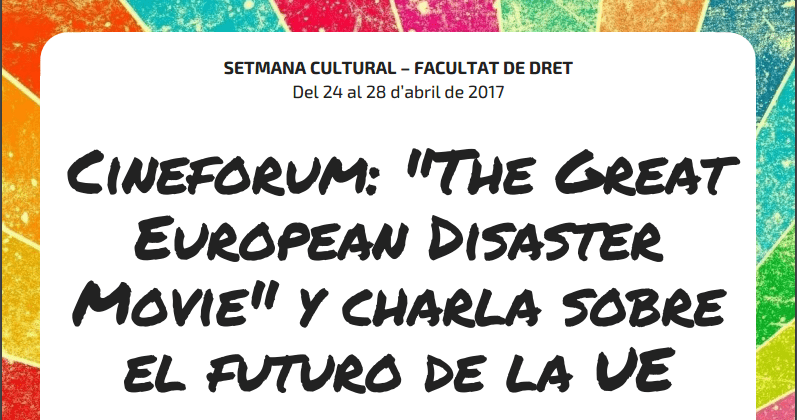 During the first 90 minutes, we watched the very interesting documentary “The Great European Disaster Movie”. This screening was possible thanks to Wake Up Europe!. The film, by Bill Emmott and Annalisa Piras, is set in a future dystopia that presents how the calamitous consequences of Britain’s exit from the European Union have unfolded. Under this vision, Brexit generated a domino effect, prompting an increasing number of countries to withdraw; this causes a collapse of the European Union by 2022. At this point, the infamous Nigel Farage has become UK Prime Minister, and has set a plan in motion to expel every immigrant that arrived in Great Britain since 2007. On the European mainland, Greece, Italy and Spain suffer deep civil unrest, the state of emergency has been declared in France and the so-called Islamic State continues its unhindered advance through Europe. The apocalyptic scenario painted by the film, although not always based on rational conclusions, was thought-provoking and served as a great starting point for the debate that took place after. The discussion was conducted by Ana Sánchez Cobaleda and the panel consisted of three distinguished speakers: Andreu Olesti Rayo, Professor of International Public Law and International Relations at the University of Barcelona, Ferran Tarradellas, Head of the European Commission Representation in Barcelona, and Carmé Colomina Saló, a journalist and Associate Researcher in CIBOB, with a long experience in European Union affairs. The discussion had a duration of, approximately, 90 minutes and the speakers tackled a wide range of subjects. 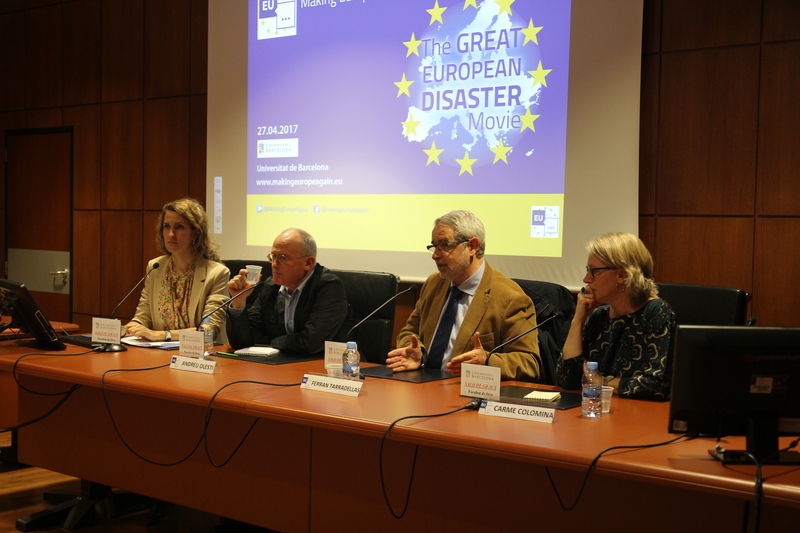 Firstly, they presented the immediate consequences of Brexit and how it can affect both the European Union and Great Britain in the future. Afterwards, Ferran Tarradellas introduced the adverse circumstances that the EU currently has to deal with: unemployment, Brexit, mass immigration, economic problems of peripheral members or young generations apathy towards the European Parliament elections; as well as general citizen discontent about European values or the several problems unveiled by the refugee crisis. These issues are widely known to anyone interested in Europe, and an assessment of said issues would have probably not contributed with anything new. Fortunately, the speakers employed most of the time analyzing possible alternatives that could put Europe on the right track again, matching the spirit of MEA’s inner debate.  The highlight of the debate came when the speakers offered an in-depth breakdown of the five possible scenarios of how the Union could evolve by 2025, as they were put forward by European Commission´s President, Jean-Claude Juncker in the White Paper on the future of Europe. Finally, the panel accepted questions from the audience which enriched the debate with its views and doubts. After the event, the general feeling of the room was of conviction that, if European States want to remain relevant in today´s world in terms of economy, political influence and demography, they should support the European Union and be more empathetic with one another. We should go as far as saying that, if someone from the audience was in a quandary before the “make it or break it” dilemma, the “make it” side has scored some serious points! Turkey referendum: what can Europe expect now?